What is Liberty Tax Online? Liberty Tax Online is an easy-to-use online tax preparation solution that is developed and distributed by Liberty Tax; one of the industry-leading tax preparation companies in the USA. The platform is backed by a rich grid of Liberty Tax offices spread across the nation. In case you get stumped during the online filing process, you are allowed to seamlessly transfer the partially done returns to the nearby physical Liberty Tax Office. Liberty Tax Online is a cost-effective program that is presented in four different modules including; EZ plan, Basic plan, Deluxe plan, and the Premium plan. All the modules are uniquely designed to help taxpayers easily find a solution that will simplify their filling process. Liberty Tax Online makes use of a professionally designed application that is made with the taxpayer in mind. The software asks you all the right questions and double checks all the calculations to guarantee 100% accuracy. It helps you to not only file with confidence but also to complete the process in a flash. With the help of the renowned multi-channel support, it takes not more than 15 minutes to complete the whole task. The software avails the help you want at your fingertips via; email, phone, social media, online chat, or in person help at the physical location. 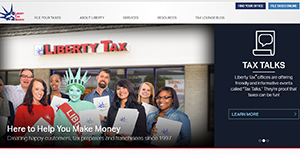 Liberty Tax Online has a simple and clean user interface with a layout that is easy to follow. All related items are laid out together on the similar page in order to maintain cohesiveness as you continue with your filing process. The software takes you through the tax prep and filing process in a systematic manner without having to click multiple pages. In addition, its right sidebar has useful help resources, and most of its items features “learn more” tags. Moreover, it’s easy to move forward and backward within the return. The platform also allows you to skip ahead to sections you have not finalized. This makes it possible to prepare complex tax returns in days or weeks, by filling each form once you receive the relevant documents. In addition, the access to over 4000 Liberty Tax offices is a welcomed relieve to novice filers. If you are considering Liberty Tax Online it might also be a good idea to check out other subcategories of Best Tax Software gathered in our base of B2B software reviews. Since each company has unique business requirements, it is advisable for them to abstain from seeking a one-size-fits-all ideal software solution. Needless to say, it would be useless to try to find such an app even among market-leading software solutions. The smart thing to do would be to jot down the various essential factors that require consideration such as key features, finances, skill levels of employees, company size etc. Then, you should do your homework thoroughly. Read some Liberty Tax Online reviews and look into each of the other solutions in your shortlist in detail. Such in-depth research can make certain you reject ill-fitting systems and choose the solution that provides all the aspects you need for business success. How Much Does Liberty Tax Online Cost? We realize that when you make a decision to buy Tax Software it’s important not only to see how experts evaluate it in their reviews, but also to find out if the real people and companies that buy it are actually satisfied with the product. That’s why we’ve created our behavior-based Customer Satisfaction Algorithm™ that gathers customer reviews, comments and Liberty Tax Online reviews across a wide range of social media sites. The data is then presented in an easy to digest form showing how many people had positive and negative experience with Liberty Tax Online. With that information at hand you should be equipped to make an informed buying decision that you won’t regret. What are Liberty Tax Online pricing details? What integrations are available for Liberty Tax Online?